David Garland has written a major new commentary on Paul's First Letter to the Corinthians. His detailed study of one of the most important epistles in the New Testament is sure to become a standard resource for pastors, students, and scholars. After an introductory chapter that considers the context of the epistle and what is known about the social setting and cultural world of Corinth, Garland turns to his exegetical study. In order to maintain the overall flow of Paul's thought and show the larger themes more clearly, the verse-by-verse comments are organized in larger exegetical units. For each unit, the author provides a summary that locates it within the broader context of the surrounding material, and he provides his own translation of the Greek text. The author's wealth of knowledge and exhaustive research is evident in his exposition. To clarify the meaning of the text, he incorporates references from parallel material in the Pauline corpus and from extrabiblical sources that highlight relevant aspects of the religious, cultural, and social context. Throughout his study, Garland interacts with notable previous commentators and provides extensive notes for the reader's consideration and further research. Relevant text-critical issues are discussed in a section labelled "Additional Notes." There biblical scholars will find comments on the more technical aspects of the text, including variant readings and grammatical issues. As with the other volumes in the Baker Exegetical Commentary on the New Testament, the author provides a scholarly commentary on the text that will be useful and readable for preachers and thoughtful lay readers. The oft-praised BECNT format and design make the volume even more accessible. About "1 Corinthians (Baker Exegetical Commentary On The New Testament Series)"
Paul's first letter to the Corinthians is one of the most important epistles in the New Testament. David Garland's thoughtful new commentary draws on extensive research and engages the best of contemporary scholarship while providing a readable study that will be accessible to thoughtful readers as well as students, pastors, and scholars. After considering the context of the letter and the social and cultural setting of Corinth, Garland turns to his exegetical work. An introduction to each major unit of thought is followed by the author's own translation of the Greek text. In the course of his verse-by-verse commentary, he incorporates references to other ancient writings that help explain particular aspects of Paul's meaning or provide information on the social and cultural context. He also refers to the work of other commentators and provides extensive notes for further reading and research. 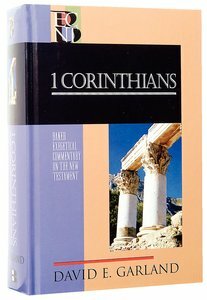 Customer Reviews For "1 Corinthians (Baker Exegetical Commentary On The New Testament Series)"
Garland provides a solid verse-by-verse commentary on 1 Corinthians. Distinctive aspects of his exposition include his eye towards demonstrating Paul's logic clearly, often laying out the flow of a passage in syllogisms, and secondarily his pastoral eye, which often includes choices of phrases and explanations which have a devotional quality too, which is welcome in an exegetical commentary. David Garland provides an in-depth exegesis into Paul's letter to the Corinthians supported by ample background and context of Corinth. Highly recommended for those who are wanting to study more deeply, lead a bible study or preparing a sermon on 1 Corinthians. AUGUST 2005: In this newest addition to the acclaimed BECNT series, Karen H. Jobes provides a fresh, insightful commentary on 1 Peter that will help students and pastors understand and apply this important letter to the world in which we live. Throughout the commentary, Jobes emphasizes the Christian's relationship to culture and the place of suffering in the Christian life. She also presents a new suggestion about the original recipients of the letter, highlights the insights provided by the use of the Septuagint in the letter, and challenges prevailing assumptions about the nature of the Greek in the letter. As with all BECNT volumes, 1 PETER features the author's own translation of the Greek text and detailed interaction with the original text. This commentary admirably achieves the dual aims of the series-academic sophistication with pastoral sensitivity and accessibility.